This is the speed test between Google Chrome VS FireFox VS Opera VS Microsoft Edge Speed Test on Windows 10. It has an unexpected result. 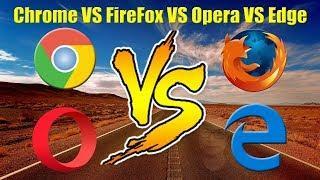 What is the fastest browser of 2019 ? Who Would Win? Microsoft Edge better than other browser? I had always been told "The Fastest is not necessarily the quickest". "What is to "bee bone", with an over used untruism; can not be taken for just another "wonder work". Have you tried Brave ?